STUCCO INSPECTIONS BY MICHAEL ANGELO MASONRY, LTD. 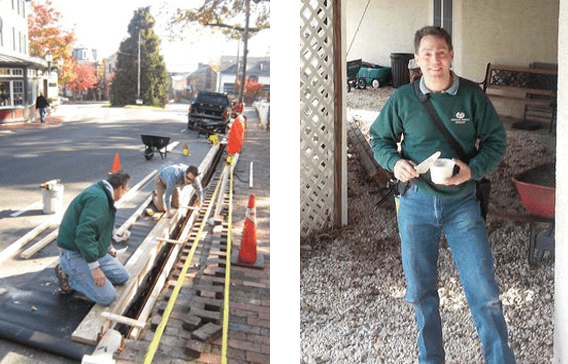 Established in 1987 in Bucks County, Pennsylvania, we offer forensic testing of Stucco & Adhered/Manufactured veneer systems, as well as Masonry Consulting, Planning and Project Management. With over 30 years of custom and historic masonry experience, coupled with National Inspection and Instructor certifications achieved with the EPA, Exterior Design Institute (EDI) and GAF, we aim to educate our clients on stucco problems and solutions. With progressive industry education, we continue to keep our clients up-to-date with the latest inspection methods and communication of emerging marketplace trends. Our customer-centric approach focuses on awareness about Stucco and Adhered veneer wall system problems and solution options. Our goal is to make our clients comfortable by familiarizing them with building terminology often used during inspections to help them better understand the inspection findings. We aim to provide long-term educational support for homeowners, communities and industry professionals and promote the establishment of preventive maintenance routines. We are Nationally Certified Invasive Stucco & Moisture Intrusion Inspectors performing site evaluations and detailed moisture probe testing services on Stucco and Adhered/Manufactured veneer surfaces to provide Independent conclusive reports for Homeowners, Real Estate Agents, Banks & Consumers. Professional group training presentations are also available by appointment. Thank you for considering Michael Angelo Masonry! What is EIFS? Is it the same as Stucco? Is there a difference? I am confused ! (or layers) of product which requires several days between applications to allow proper drying known as “cure time”. Stucco is porous! It will show moisture/dampness on surfaces, especially after prolonged rain, and usually dries out in a day or two. This is why it is important NOT to paint over stucco unless the paint is a "perm" rated (breathable) product ! Ironically, Stucco (AND “Adhered/Manufactured” veneers) can also be classified under the “umbrella” of EIFS (Exterior Insulation & Finish System), as it IS a type of Exterior system. Yet, most professionals and novices too, tend to categorize EIFS as the “Synthetic” stucco, referencing a SYSTEM where dense Polystyrene foam is fastened to the building “substrate” and a pre-blended (Engineered) mixture of Cement AND Acrylic Polymers are then applied to the wall, similar to that of a traditional stucco application. NO home is truly "maintenance free"... therefore, ALL STUCCO/EIFS finishes need to be properly maintained by performing routine annual inspections to ensure no moisture or extensive cracking has occurred. In the event such issues arise, proactively repairing the areas will considerably reduce the potential for moisture penetration and ensure the finish of your home for years to come. I am buying a home which has a stucco finish on the exterior, why am I now just hearing about stucco problems? Should I be worried? Should I still consider buying a home which has stucco? Stucco finishes have long been an accepted building product for decades. Done properly, stucco provides a durable finish while offering a variety of Classic and Contemporary appearances. Like everything else, as technology advances so do products and their successes (and sometimes...failures !). An example of this is where some more recent applications of Cement based Stucco (as well as those of acrylic finishes ) over newer types of wood particle board, along with the introduction of “housewrap” barriers, have developed unforeseen situations where the “vapor transfer” is inadequate, resulting in moisture being retained within the walls. The good news is that the cause of these issues has been identified and new standards have been adopted. Selecting a CERTIFIED Inspector is KEY during your home purchasing phase, not ONLY to identify potential issues but to offer suggestions for possible REMEDIES and SOLUTIONS for all parties involved! I bought my current home, which has a stucco finish, five years ago. Why was there no mention from my Real Estate Agent or Bank about a stucco inspection on MY behalf, at THAT time? I am NOW Selling my home and am worried about what inspections to expect from a potential Buyer! What do I do now? WHO do I call? Initial knowledge of Stucco/EIFS issues appeared to be limited to certain regional areas (coastal/humid communities) beginning in the late 1990's. Unless there was specific, visible evidence of damage observed, most Real Estate Firms and Banks were not aware of the progressing situation. A telltale sign of increasing awareness of issues with this type of “cladding system” was the introduction of the term “EIFS” in some Agreements of Sale. Eventually, as more information came to light, many Listing Contracts and Offers to Purchase were being written with specific language identifying the exterior finish as "Cement based Stucco or EIFS". In 2002, as the level of occurrences escalated, several of the National Building Code Organizations (IBC/IRC) began to address this obviously growing problem and consulted with Material Manufacturers, Forensic Laboratories (ASTM, et al.) and Contractor Trade Guilds to begin the process of developing a NEW standard, not just for the application of Stucco/EIFS systems, but a COLLECTIVE effort to educate and manage the manufacturing and installation processes of Window/Door/Roofing and Gutter products as they ALL encounter “penetration” areas (openings in walls/roofs) where the likelihood of water entry can occur. Additional preventative products were developed ( i.e. Drainage Planes, Kick Out flashings and Casing Beads to name a few) to enhance the systems OVERALL performance and minimize future water penetration in the “building envelope”. Regardless of the “years of experience” which many Contractors quickly offer as their competitive edge, it is best to seek advice from an experienced professional COUPLED with their resume’ of continuous, progressive education in achieving the BEST and most up to date industry standards and Certifications. For this reason, you will note there are very few Qualified, Nationally Certified Invasive Stucco Inspectors as New Installation Protocols, Authorized Training Institutes and their Curriculum have only recently been developed within the past 6 years. Be sure to consult ONLY with those professionals who provide these credentials. Call us at 215-378-2056 or Email us at StuccoTesting@gmail.com to schedule your evaluation ! If you need this service you will NOT find a better person. Everything is explained in such a way that you will understand the process. Michael and crew are great to do business with. Prompt, courteous, knowledgeable and trustworthy! Don’t hesitate!! I had a great experience with Michael during a stucco inspection. I called him needing a quick turn around, and while he was booked a month out, he found a way to squeeze me into his busy schedule the very next day. Michael is fantastic. We had him perform a stucco inspection and we were thrilled with everything about his service. He was communicative, attentive and easy to work with. He genuinely cares about educating his customers and will talk them through the process. We had Michael do our stucco inspection as a proactive step in the future sale of our house. Michael was extremely professional, knowledgeable and detail oriented. We wanted to do this once and do it right and Michael's experience was key! This is one of the best companies I have ever worked with. Michael was able to help me and my husband through the topic of stucco and how it related to the sale of our new home through every step. He is professional, timely, informative, and an asset to anyone looking to buy a home with stucco. I highly recommend Mike after working with him on two projects at my house. First, he performed an initial stucco inspection and second, he inspected the remediation work involving a complete EIFS installation. It was a pleasure working with Mike as he is very knowledgeable, honest, punctual and a good communicator. Michael was fantastic to deal with. He is responsive, professional, thorough, and very willing to spend time to make sure you understand the technical aspects of his work and his findings. I highly recommend his services! Outstanding and thorough inspection. Mike walks you through the process, the technology and the results as he works. I highly recommend him to anyone needing a stucco inspection! Michael and his team made the process easy with their extreme professionalism, knowledge, and detailed report of their findings. We would recommend Michael to anyone facing the difficult issue of potential stucco removal.